There’s nothing like the occasional reminder that commercial effects pros get to do stuff we can’t. 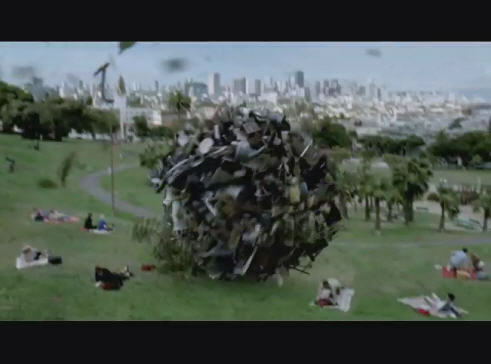 Today’s example: a real-life Katamari Damacy, starting with a single person (ouch) and rolling through a city, courtesy the Travelers Insurance group. The results are stunningly realistic, particularly at the beginning: there’s a sense of real physicality to it, which is hard to do with things that are physically impossible. Why so well done? Read the list of credits: none other than Kiwi Lord of the Rings vet Weta Digital (motto: “Industrial Light and what?”) did the effects. For video inspiration, you can’t do much better than No Fat Clips; they’re a fantastic source of entertainment and knowledge. Now, there’s some kind of message here, something about … insurance? Oh, I don’t know. I’m just going to watch this thing again.